On Monday 19th March I'll be speaking at PHP Leeds. 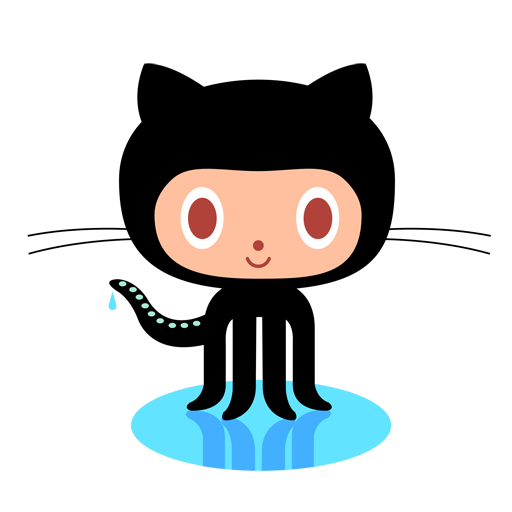 The topic is all things git and github; as an open source project lead I see lots of very capable programmers taking their first steps with github. In this session we'll talk about how you can use these tools to contribute to open source (or your own projects, of course), covering both "what to click in the web interface" and "what to type at the command line" for git and github respectively. Come along if you want to know more about git, open source, or github! I'm deeply involved with an open source development project (joind.in, the event feedback site) and we recently made the decision to move our issue tracking away from GitHub (because it's awful and meets none of the requirements for a bug tracker, but that's a post for another day). In order to make this happen more smoothly, we wanted to migrate our open issues from github (to JIRA Studio, since Atlassian generously provides accounts here for worthy open source projects - thanks Atlassian!). I looked around for some export functionality for github but I got a lot of posts complaining it wasn't there. Since I hate applications that take your data and refuse to let you remove it, I was disappointed by this news but further inspection showed that although there might be no "export from github" button, there's an API that more than has it covered. The API returns JSON which is easy to work with from many programming languages, and is perhaps even more powerful and flexible than the simple export I initially expected, so here are some examples. Recently, a github project that I contribute to, joind.in, moved from an ordinary github user account over to an organization. Getting contributors moved over is pretty straight forward, I have a fork of the main repo on github at http://github.com/lornajane/joind.in and that updated to show itself as being a fork of the organisation's repo rather than the original user repo that it had been set up under. Recently I've been doing more git than I ever intended to, working with the Joind.in codebase, contributing and managing contributions to that. I quickly realised that I needed to make changes on branches, and since I'm new to git, it took a while to figure some of this out. 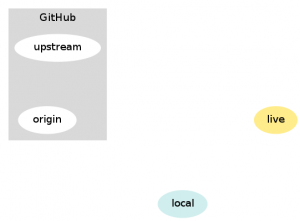 I'm pretty confident now* so I thought I'd share how I work with branches in git. The entry with the star next to it is the current branch, so here you can see that I have branches "master" and "api" and I'm currently working on the "api" branch. If you only have one branch it will usually be called "master". If you use "git push" on its own, it will push all branches which exist on both the local repo and the origin - but will not push any private branches unless you specify that it should. The http://help.github.com site, Github's own documentation, is actually brilliant and has really helped me to get up to speed with working with my own code and contributions from others. 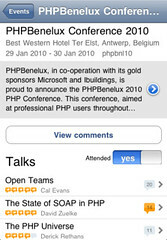 Recently I've been doing some bits and pieces with the open sourced event feedback site joind.in, including some work on its API to facilitate development of an iphone app. As a conference attendee, speaker and organiser, I use this site a lot for the various events that I am involved with and its a great asset. 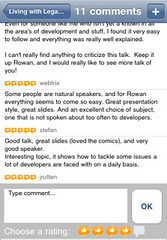 My boyfriend Kevin was thinking of developing an iphone app, mostly to find out more about the technology, and I suggested he take a look at the API for joind.in and consider building something on that. The joind.in project belongs to enygma, a.k.a. Chris Cornutt from phpdeveloper.org and he has the code available on github - so we grabbed it. The API wasn't previously used by much so we were able to tidy it up a bit and then consume it from the iphone to suit our needs. Chris has accepted my alterations to his existing project with grace - even when I've totally broken the live site with them!! The joind.in site is a classic MVC setup and the API already existed within the application. It is implemented with a separate set of controllers for the various actions supported by the API, which all inherit from a controller which handles the output formats etc for the XML and JSON responses. It isn't the world's best API but its perfectly sufficient for the task at hand - I intend to write some examples for using it but until then you can read this post from Derick about how he used the joind.in API to pull in comments on his talks onto his own site. 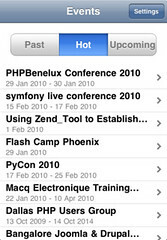 If you have an iphone or ipod touch and you're attending an event any time soon, then download the app - its under "utilities" in the app store. Comments, suggestions, bug reports and feature requests are all gratefully received (no promises about fixing/implementing them but we'll do our best!). Our app went from submission to approved in 3 days which is very fast - thanks apple! Recently I've been contributing to the code project behind joind.in, the event information and feedback site. I rely on joind.in a lot and after putting up with a frankly astonishing volume of feature requests from me, its owner Chris Cornutt very politely suggested that I might like to fix some of them myself. The project is hosted on github and I haven't traditionally been much of a git fan, but I wanted to contribute so I set off to work out how to begin. To do anything useful I first needed to sign up for an account. Github has a range of accounts but I found that with one of their free accounts I would be able to get started and contribute to the project. This gives me a project space of my own and a user to tie all my activities to. In order to authenticate against the github servers, you need to set up an ssh key and give them your public key so they know you are you. You'll then need to tell git to use this key whenever it makes contact with the github servers. I do quite a bit with ssh and ssh keys myself so I was comfortable with this step. Even if you are totally new, its still pretty straightforward and they have a great howto on github itself which will help. I had issues with git not picking up that it needed to use a non-standard ssh key, but I found the answers in this entry on the git website. In a nutshell, set up an ssh alias, set the key in there and then use the alias instead of the actual URL when giving the repo location to git. This now works like a charm for me. Now, github uses "fork" where I might choose to say "checkout" - fork in my world means something else completely. But in this case you're just making your own copy of the project repository. This is where you will commit your changes to and it retains its link with the original repository making it easy for anyone with commit access to that to pull in your changes. Patch files are nowhere to be seen, and although I was wary at first, this is project collaboration at its most painless, I'm impressed! Forking was relatively simple and again there was great documentation on the github site. In particular I recommend that you take the time to follow the bit about adding an alias for the "upstream" repository - this made committing my changes to the main joind.in repo really easy. The forking instructions linked above also gave a description of how to actually use git, how to get my changes applied to my local repo, and how to push them to my remote repo on github itself. Once I'd fixed a few things, I was ready to push the code back to the main project so that Chris could consider it for inclusion. This is done by making a pull request from the main project page - you can add a comment about the changes you are supplying to help the maintainers to manage all the incoming patches.